As the twelve were seeking further explanation from Jesus concerning divorce, people began bringing children to Jesus so that he might touch them. Even as the disciples objected, they kept bringing the children to be touched and blessed. Throughout Mark’s gospel, being touched by Jesus meant being healed, restored, made whole. In the confrontation between the Pharisees and Jesus, we see the brokenness of humanity and the need for restoration. The children represent the weakest and most insignificant among us. They serve as representatives for all who seek God’s healing love, reconciliation, and forgiveness. 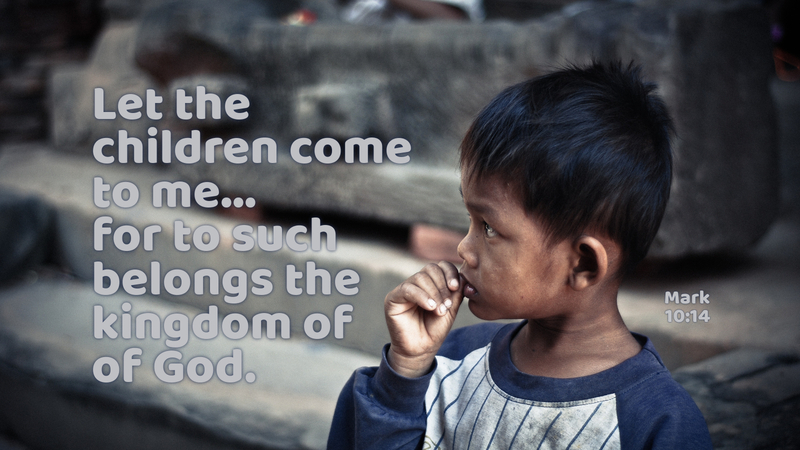 People of God, we are the children. We are the ones coming to Jesus that we might be healed. We are the little ones who are always welcome in the arms of our Savior and Lord, so that he might touch us, heal us, forgive us, and restore us to wholeness of life. Jesus says, “Let the children come to me; do not hinder them.” Bring those who face the hardship of sin, sickness, divorce and brokenness. In their weakness, Jesus will bless them with strength. In their sorrow, Christ will give them consolation. In their repentance, our Lord will bless them with God’s mercy and grace. Prayer: Touch me, O Lord, with the power of your love. Amen. Thank you Pastor for the words of wisdom. We are to go to Jesus as a child, innocent and willing to accept the words of our father. The world has tainted us, just like the pious Pharisees, who thought they were above the law. There are times we wish we could erase our past, at least in our minds, to keep ourselves in the present with Christ.